The crowds have dissipated, the heat spell is over, and the crowds of visitors have passed. Fall is almost here and we couldn’t be MORE excited. Not only do we offer specials EVERY weekend in the month of September, there are a lot of benefits of visiting the park at this time. Here are the 6 reasons why your family should come out to the park this fall. There’s nothing better than getting a good deal. You and your family could get the same attractions that everyone else did during peak season, at a HUGE discounted rate. There is an event every weekend in September that offers guests discounts. To kick start the off season, there is Grandparents Weekend and Community Appreciation weekends. We celebrate Grandparents the first weekend, and then help out our community the rest of the month. 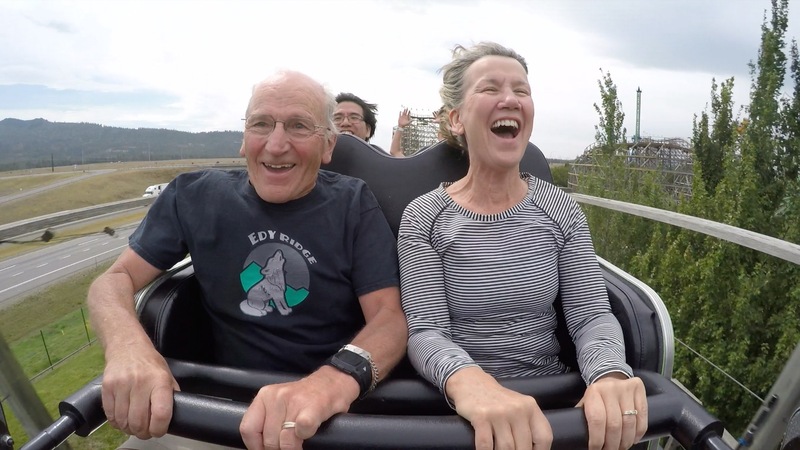 September 8 & 9, 2018 – What better way to celebrate Grandparents’ Day than at Silverwood Theme Park! Silverwood shows their appreciation for Grandmas and Grandpas by admitting them to the park for FREE when accompanied by a grandchild. For each grandchild that PURCHASES a ticket, they will be given one FREE ticket for Grandpa OR Grandma. Plus everyone receives a special pricing of only $38.00 for General Admission (ages 8-64) and $21.00 for youth/senior admission (ages 3-7, 65+). Compare that to the normal $51 gate price. September 8 & 9; 15 & 16; 22 & 23, 2018 – Save money and help our local food banks! For EACH GENERAL ADMISSION SOLD $4 WILL BE DONATED TO HELP LOCAL FOOD BANKS and for EACH YOUTH/SENIOR TICKET SOLD $1 WILL BE DONATED. Admission is only $38.00 (ages 8-64) and $21.00 (ages 3-7 and 65+) at the front gate. SAVE more when you purchase your tickets at silverwoodthemepark.com. Not valid with any other discounts, coupons, promotions or special offers. Most families at this time have left our park to send their kids back to school. If your children start later, or you would love to spend a weekend away, then this is the ideal opportunity for your family. Wait times are very short, and you will have the opportunity to get the most for your money. Your kids can ride their favorite ride to their heart’s content. During the last weekend of the season, guests have the opportunity to ride Timber Terror BACKWARDS. If you don’t normally go to Scarywood, but have always wanted to ride this ride backwards, here is your chance. Take our word for it. Backwards is better. One part that can deter guests in our peak season is the weather. It can get hot waiting in lines and walking from place to place. Luckily the month of September offers a variety of weather that can appeal to all folks. In the early autumn, our guests usually enjoy fantastic weather. Temperatures can often be expected to reach the 70s and 80s through September. Compare that to the sweltering heat of August and things are starting to look pretty good. Late September is usually still warm enough during the day, and just requires a light jacket at night. Check out our local weather before your next visit to help you pack. Our Landscaping crew takes pride in the time and effort that they put into to make Silverwood so beautiful. It is truly picturesque watching the grounds transition to Fall. The colors in the trees flourish and explode this time of year. You may not come all the way out to the park just to enjoy the change of season, but you will appreciate it while you are here. End the Summer season with some of the best memories with your family. Sometimes summer sneaks up on us, and the time escapes us. If you still feel like you need a few extra days of fun to bond with your kids, this is the place to do it. Many families even make a Silverwood visit a end of year tradition. Who knows, maybe your Christmas card will feature your families dip down Tremors roller coaster. Our Campground is just steps away from our front gate, and people LOVE it! There is a reason why we sell out during our peak season. Luckily, there are still some spots open for this fall that have your name all over it. One of the best parts of fall is meeting around the campfire. To find out more information on our campground, head here. Does your family take a trip to our park every fall? Share some of your favorite memories in the comments below, and dont forget to enter to win FREE tickets for your next visit! We love silverwood especially in the fall. I would not include the Saturday of Labor Day weekend in the “less busy” category. It was super, super busy. Maybe wait until the next weekend for less crowds.